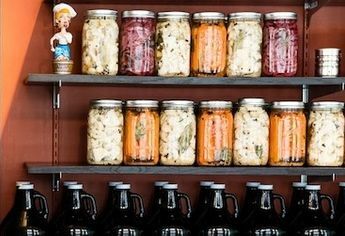 The most important part of the pickling process is to wash all produce and jars or containers well. Once all produce and containers are clean, begin the recipe. Combine all the pickling liquid ingredients except the beer in a pot and bring to a boil, then remove from the heat and let cool. Add the beer. Divide the produce between the jars and cover with at least 1 inch of pickling liquid. Place the lids on the jars, let the vegetables pickle for at least two hours before eating. Store in the refrigerator. They are best after one week and will keep for up to four months refrigerated.